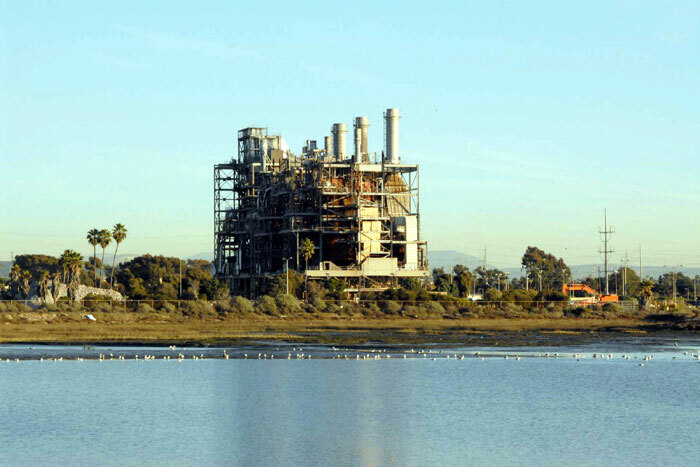 CHULA VISTA — Plans for the redevelopment of the Chula Vista Bayfront are closer to being realized with the removal of the South Bay Power Plant scheduled for 7 a.m. Saturday, Feb. 2, weather permitting. Demolition of the steel-framed structure will open the site to public parks and redevelopment — and the public can watch the old plant get blasted off the Bayfront. After years of working toward demolishing the plant, the actual implosion is expected to take just two minutes. Port of San Diego officials anticipate a large spectator turnout, since residents and city officials have been looking forward to the removal of the plant — often referred to as a local “eyesore” — for several years. Free public parking will be provided near the demolition viewing area on the far south side of Bayfront Park, at the foot of Marina Way in Chula Vista. The Port of San Diego acquired the 165-foot-tall plant several years ago and promised to remove the old facility “for the betterment of the San Diego region.” The plant’s demolition will mark the first step in opening the site for other uses. The site is part of the “shovel-ready” Chula Vista Bayfront Master Plan that will make over more than 500 acres of waterfront property. Designed and developed by the port, the city of Chula Vista and property owner Pacifica Companies, with extensive public input, the plan includes a 24-acre public park, industrial business park and a mix of residential, retail and more than 240 acres of parks and nature preserve. “After the years of hard work that went into the approval of the Chula Vista Bayfront Master Plan, the plant’s removal will kick-start redevelopment plans. as we look forward to further progress on what will become a world-class destination for the entire region,” said Chula Vista Mayor Cheryl Cox, in a prepared statement released by the Port of San Diego. Small, controlled explosive charges placed within the old plant will help to bring down the mammoth structure. Heavy equipment will then be used to break up the structure. Demolition and cleanup is expected to be completed by the end of 2014. According to the port, the project is expected to generate about 21,000 tons of recyclable metals and up to 3,400 tons of other non-hazardous waste, which will eventually be recycled and salvaged. The plant has been located on the Bayfront since the late 1950s and was decommissioned in 2010. It takes up approximately 13 acres on a 115-acre leasehold held by the port’s tenant, Dynegy South Bay LLC. The implosion plan being carried our by the plant’s former operator, Dynegy South Bay LLC, will follow comprehensive measures to ensure the safety of the public, air and water quality and the environment. A land and water perimeter will be established around the site to limit access to the area. The California Coastal Commission and the city of Chula Vista approved the plan.